Rumours seem to have been backed up by a Newsweek cover story about the new iPod. The first major change is that the navigation has been replaced by the mini-iPod style touchpad. While this is good for the overall look of the unit, I wonder how intuitive those multi-button functions will be for newbies? Interesting to see that the range has been slimmed down to two models; the 20 and 40GB machines. The 15GB has been dropped - as have the prices - presubmably to make room for a top range 60GB model in the near future. Battery life. Apple seem to have sussed that 8 hours is not enough and have boosted it to 12. That's a little better, but with Creative coming out with 25 hour battery lives, it still falls short. Now the questions: are we going to see this in the UK before the iPod Mini? How does this affect the rebranded HP iPods? And are the new OS features going to be release as updates for the older models? Worst drink drive excuse... ever! "I wasn't really that drunk, I was just over-served" - Country singer Glenn Campbell during his recent court appearance for a traffic offence, of which he remembered nothing because he was "in a blackout mode". Every so often, something odd happens - something so odd that you initially write it off as a joke, but it isn't. I mean, what would you think if I said Commodore were back? How about if I said Commodore were back making hardware? How about if I said Commodore were back making hardware to rival the iPod? Yup. It's true, and it's up there on the right. What's even weirder is that they've named this 20GB device the eVic - as in Vic-20 - the connection between them being... the number 20. What's even weirder (you may have to sit down for this) is that you can also buy mPet and fPet MP3 players. These are smaller, flash-based players that will compete with the likes of the Nomad and iRiver devices. To back up these players, there's also Commodore World. Yup, that's Commodore's online music shop. Yes, it is... seriously. Take a 10 guys, a couple of blocks of Manhattan, stir in some cell phones and add a touch of nostalgia and what do you get? Pac-Manhattan! This is essentially the 80's arcade game transposed to the streets of Manhattan. get four of your mates to dress up as Inky, Pinky Blinky and Clyde and chase Pacman around the city as he eats virtual dots and Power Pills. At the moment progress is mapped out in a central control room, but throw in GPS and maybe some giant foam fruit and it'd be perfect. There are moments when I really envy the Japanese for getting cool hardware that - when you see it - just know will never see the light of day on our shores. 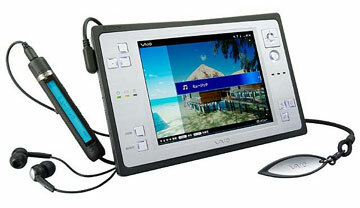 This time gadget envy comes in the form of the Vaio VGN-U70. Smart isn't it? On paper it's nothing spectacular for a PC - a 1GHz Centrino box with 512MB of memory and a 20GB hard drive. What makes it stand out is it's size - 16.7 x 10.8 x 2.6cm, weight - 550g and the fact that the 5" screen has a resolution of 800 x 600. In short, this thing is a full-on PC in a very tiny package! As a long time user of a Compaq TC1000 tablet PC, it's interesting to note that this is not running the Tablet Edition of XP (which I think is a pretty good tablet OS implementation), but the Pro edition augmented with Sony's own software. I'm assuming that this is probably for licensing purposes and also to help Sony gain expertise in the pen computing area. They might want to have another go at redesigning that stylus though. From experience with PDAs and tablets, a barrel-like stylus is much more comfortable to use for long periods of time than a flat 'scalpel' stylus. It's nice to see them taking the media side of devices seriously and bundling in a headphone remote - listening to MP3s with this is sure to have iPod owners going green - yes it does video too. If you want one, the U70 will be shipping on 19th May for around $1800. Don't forget to factor a plane ticket into the price... and on a sidenote, even the website looks awesome. PSU's, wall warts, power adaptors. I have loads - 16 in fact. They are all different. I hate them. My biggest gripe at the moment has to be external PC devices. Internal devices are fine - same connector. I could take my internal hard drive and plug it into a PC in Uzbekistan and it would work. So why is it then, that as soon as that 5.25" drive gets shoehorned into an external plastic case, it requires a power connector forged by century old monks in the depths of Peru!? First argument will inevitably be; things need different voltages and currents and that's why they have different connectors - so thick people don't blow stuff up. True. Very true. But why not stick a data channel in there so a device can tell the adaptor what power requirements it has. And why not have a standard 4 or 6 point plug so you can supply multiple voltages to devices? Why? WHY? We seem to be supplying low power requirements through USB and Firewire, so why not go the other way, cater for power-specific data on power lines? It seems to make sense - everything else is getting smarter and more standardised, so why can't power go the same way? Sergei Mikhailovich Prokudin-Gorskii - the daddy of colour imaging? long-time programmer friend living in London. 20 something web-monkey / photographer.